· DUO PRIMER – effective and practical herbicide for poslevskhodovy destruction of one-year and long-term broad-leaved weeds in crops of grain crops and flax. · DUO PRIMER – provides double protection against more than 60 types of broad-leaved weeds of the grain crops and flax growing in crops. · DUO PRIMER – does not demand addition of adjuvants or other herbicides for expansion of a range of action. Just dissolve in a tank of a sprayer and work! · DUO PRIMER – is effective against one-year and long-term broad-leaved korneotpryskovy weeds, such as types of a bodyak and a sow-thistle. Very effectively suppresses development of a bindweed field. · DUO PRIMER – has a wide technological window in terms of application and consumption rates of medicine, convenient for work. · DUO PRIMER - has no restrictions in a crop rotation with grain grains with cultures and flax! Selective herbicide for protection of crops of grain grains of cultures and flax against one-year and long-term two-submultiple weeds. Herbicide of system action. DUO PRIMER, being quickly absorbed by leaves and partially root system of weeds, it is capable to move on all plant with the descending and ascending current of nutrients. Thanks to system action medicine gets into all parts of a plant and collects in growth points. At the biochemical level herbicide influences the enzyme an atsetolaktatsintaza (ALS) participating in biosynthesis of irreplaceable amino acids that breaks processes of synthesis of proteins and causes the termination of cell fission in meristemny fabrics. Active growth of sensitive weed plants and the competition to culture stops within several hours after processing. In the first 5 – 7 days there is a yellowing of leaves of susceptible weeds, in 10 – 14 days hlorozny spots are formed and die off growth points, and death happens within 3 – 4 weeks after spraying, depending on weather conditions. The most bystry herbicidal effect is reached when processing at early stages of development of juveniles two-submultiple and in a phase of the socket of perennial korneotpryskovy weed plants, and also under favorable conditions for growth: to optimum humidity and temperature. 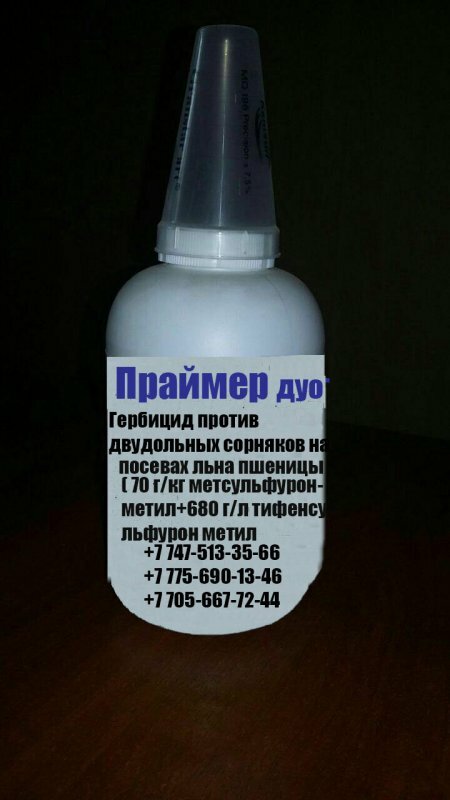 In the recommended consumption rates and regulations of application, medicine not fitotoksichen for the registered cultures. Medicine is recommended to be used in a crop rotation on flax with the subsequent grain grains cultures and, on the contrary, on grain grains with the subsequent to them flax. The next year after processing it is not recommended to carry out crops of such cultures as colza summer and winter, sunflower, vegetable, melon, bean. Cases of emergence of biotypes of weeds resistant to herbicide DUO PRIMER in experiences are noted. However for prevention of their emergence it is recommended to alternate in a crop rotation use of herbicides from the different chemical groups differing on the action mechanism. The PRIMER of DUO is compatible to the majority of the herbicides, fungicides, insecticides, regulators of growth and mineral fertilizers applied on grain crops, in particular with 2,4-D, MTsPA, graminitsida. In each case, especially in mix with microfertilizers, preliminary check on chemical compatibility of the mixed components is necessary. It is not recommended to use DUO PRIMER in tank mix with medicines on the basis of a malateion, a dimetoat and pirimifos-methyl since it can lead to a burn of cultures. Class of danger to bees – 3 (maloopasen). At application it is necessary to observe the following ecological time limit: to carry out processing of plants at a speed of wind up to 4 - 5 m/s; a boundary and protective zone for bees – not less than 1 - 2 km; restriction of summer of bees – 6 – 12 hours. Use of medicine in limits is forbidden by water protection of a zone of fishery reservoirs. Spraying is carried out to a windless clear weather in morning and evening hours, providing uniform wetting of a sheet surface of weed plants. The interval between processing and possible loss of rainfall has to be not less than 3 - 4 hours. Not to arrive and not to harrow crops within one week after use of herbicide. Processing of bean and forage crops, grain with subsowing, is forbidden. Not to apply on crops of the cultures which are in a condition of the stress caused by frosts, a drought, flooding or other factors. For processing to use land shtangovy sprayers. Consumption of working liquid of 100-150 l/hectare. At a high contamination to use the maximum consumption of working liquid. Working solution has to be used within 24 hours after preparation.